The Chilmark library shows the documentary "The Fish Belong to the People," Wednesday, June 9 at 5:30 p.
The May 7 announcement of a 15-year deal between Cape Wind and National Grid prices electricity created by wind turbines at 20. The Martha's Vineyard School of Ballet performs their spring show, "I Do Believe in Fairies, Journey to Never Never Land" tomorrow, June 4, at 6:30 pm. In conjunction with Health Week at Island Elderly Housing, Olsen Houghton's MVRHS leadership class joined residents at Woodside Village last Thursday to prepare the Woodside Community Garden for planting. 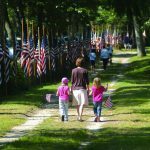 Glorious weather and an influx of welcome weekend visitors helped make the Island's Memorial Day weekend an occasion for both solemn remembrance and a celebration of summer to come. 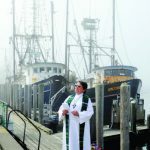 On Sunday, the Chilmark Community Church celebrated its annual blessing of the fleet service with the fleet, or parts of it, as almost-active participants. Once sheep pasture, then bombing range, the next chapter in the history of Nomans Land, the small island southwest of the Vineyard, is about to be written. The Island Affordable Housing Trust has selected MacNelly Cohen Architects of West Tisbury and LDa Architecture & Interiors of Cambridge to complete design plans for six multi-family affordable houses in Tisbury. Writing the other day to a daughter, I recalled for her an occasion when my practices — long ago as a new, young parent — came into conflict with the seasoned practices of my own parents. The unfortunate 81-year-old woman who triggered the three-car crash at State and Old County roads should consider relinquishing her driver's license. it's hard to forget her intense glare. A backhoe pulled a dead humpback whale out of the surf Sunday so that New England Aquarium staff could perform a necropsy. 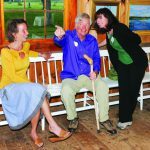 This past weekend, the annual Family Planning Art Show was held at the Ag Hall in West Tisbury, and as always, drew a large and appreciative crowd. One hundred fifty feet from the base of its gleaming steel tower to the tip of a turbine blade at its highest point, Morning Glory Farm's newly erected wind turbine made its mark in Edgartown this week. Che's Lounge, the beloved coffeehouse that was tucked away in the alleyway on Main Street in Vineyard Haven, closed on Monday due to financial difficulties. We cut, clear, tidy, and attempt to create new idylls. On May 25, Robert B. "Come and sit by Katherine C.
I'm having trouble believing it is already June.